Alyssa Burrows and Anita Shah are two McMaster University students who are looking to make a difference in the world of food allergies. While both volunteer with us, they took it a step further by spearheading a food allergy club at McMaster. The club recently held a bake sale that raised $160, with all proceeds being donated to Food Allergy Canada. The pair are excited for the future and have many ideas to grow allergy awareness, including several events planned. Anita and Alyssa recently spoke with us about their new group and the bake sale. What made you get involved with Food Allergy Canada? Alyssa: I became involved with Food Allergy Canada about two years ago in Grade 12 when I was 17. I applied for the Youth Advisory Panel (YAP) after the idea was suggested by the wonderful staff at the Kingston Allergy and Asthma Clinic where I had a co-operative education placement. Being involved with YAP has been an amazing experience as I’ve gotten to work on many exciting projects, including the mentorship program Allergy Pals, a youth allergy conference, researching university guidelines, and being on a committee that provided input for the post-secondary guidelines. Food Allergy Canada has been a great support for myself and projects such as starting this club! Anita: In 2015, I attended one of Food Allergy Canada’s conferences and learned about the youth allergy program. Living with tree nut and peanut allergies my entire life, but never feeling a part of an “allergy community”, I felt this would be a great way to feel supported in this aspect of my life and share my own valuable experiences with others. What has the reaction been to your food allergy club at McMaster? Alyssa: It’s been quite positive, we feel very supported by our community and our members. For example, we had a meeting with a school dietician and she had many great ideas and suggestions about how to raise awareness on campus and build a community for students with allergies at McMaster. She also had experience working with students who created an allergy club at Queen’s University. She seemed genuinely excited about creating an even safer allergy community we could help foster; especially among first-years, as they’re the ones who live on campus and eat at the campus eateries daily. The school’s clubs department and the McMaster Student’s Union have been really supportive, providing us with finances and resources. Anita: Although our club was only ratified in late January, we’ve received a surprising amount of positive feedback. Our executive and general members are eager to contribute ideas and support the club in any capacity, whether attending our general meetings or helping prepare for club events. The group was only started part-way through the second semester in January, but still gained about 15 members. Alyssa: We’re hoping our membership will grow more next year when we start fresh in September. Anita: We hope to attract more during the upcoming school year, especially new first-years coming to McMaster. What was the bake sale like? Any standout/hot-selling items? How much money was raised? Alyssa: It was really fun; it was four hours long in our busy student centre. We advertised with posters around campus that were made by club members and executives. We also posted updates on our Facebook page. Our members took turns doing 1-hour shifts. We also had signs, ingredient lists, and a Food Allergy Canada donation jar. We sectioned off parts of the table by what the baked item was free of: for example, we had an egg-free section, peanut- and nut-safe sections etc. We also made sure to have different tongs designated for each bake good to avoid cross-contamination, and some items were even individually wrapped. Some hot selling items were Anita’s blueberry squares (the bake sale was hosted in the morning so those seemed to double as a breakfast bar), vegan muffins, and the gluten-free cupcakes and brownies. 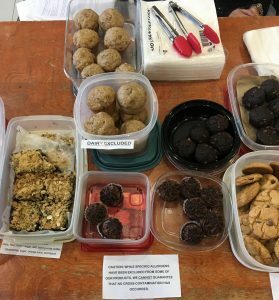 I think the vegan muffins and gluten-free items were particularly popular because individuals who are vegan, allergic to egg or dairy and/or celiac, or avoid gluten often cannot often eat baked goods. Some people came back several times throughout the day because being able to purchase items from a bake sale is not something they normally do or feel safe doing. Items were by donation, so individuals could give what they could. Anita: The bake sale featured homemade goods that did not require refrigeration. For example, members baked chocolate chip cookies, blueberry squares, banana muffins, various flavoured cupcakes, and more. We sold in one of the most frequented areas on campus, and were able to raise $160 in just four hours! Was it exclusively allergy-friendly items for sale? Alyssa: The goal was to have as many allergy-friendly baked items as possible, however each item was not free of all the top-10 allergens. We asked people – who were comfortable with baking – to pick a few of the top-10 allergens and avoid those. From there, we grouped the baked good into categories. In the future, we hope to avoid more allergens, such as soy. Anita: We asked for baked goods that catered to one of the major allergens. To ensure that members were familiar with general protocols on avoiding cross-contamination, we gave a brief training session on how to read labels (i.e. steering clear of any “may contain” warnings) and how to properly sanitize a potentially unsafe kitchen. However, we did say at the bake sale that we couldn’t guarantee that no cross-contamination had occurred. Did you use the bake sale to raise awareness about food allergies? Alyssa: One of the goals for the bake sale was to raise awareness about food allergies. I think the Facebook event page and posters gained some attention/curiosity because non-allergic people tend not to think twice about what they’re eating, while people with food allergies always put a lot of thought into what they’re eating, where it has come from and what it may have been in contact with. 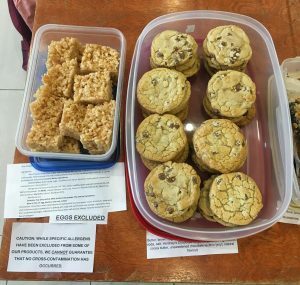 The bake sale served as a reminder to the community that there are many students living with food allergies. Additionally, we were turning a space (the “bake sale table”) which is typically avoided by allergic students like myself into an inviting place. We had some individuals throughout the day come by and talk about their allergies. One particular interaction I had was talking with a mom whose son had a peanut allergy like me. She asked me and the other volunteers about our experiences with allergies both at high school and university and if we ever had to use our EpiPens®. I shared with her how her son could get involved with Food Allergy Canada or participate in their Allergy Allies program. Additionally, by raising money for Food Allergy Canada we know the money will go toward more initiatives that raise awareness. Anita: Absolutely, the bake sale hopefully raised awareness about our club, Food Allergy Canada, and in turn, allergies in general! 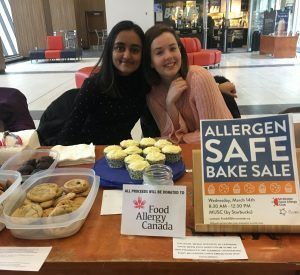 The unique nature of this bake sale, being allergen-safe, was the first of its kind at McMaster; therefore, it definitely raised awareness about allergies. Who prepared the items for the bake sale? Alyssa: Our club’s members volunteered to prepare items for the bake sale but only if they felt comfortable in doing so. Beforehand, we had a meeting and prepared an instruction sheet on how to read labels, how to clean your kitchen and utensils etc. Having this mini-lesson also served as an educational piece as many of our general members don’t have food allergies but know someone who does. At this meeting we also made some posters and had an allergy-safe cook book for people to grab inspiration from. We also asked that everyone who baked something wrote down a full ingredients list. Before baking, I washed all the cooking utensils and containers with soap, water, and new sponge, and cleaned all the countertops. This is above and beyond what I normally do but, we just wanted to be vigilant. Anita: Generally, members would bake a good that catered to their specific allergy or dietary restriction. Do you have any other events planned? An allergy and immunology research night. McMaster is a very research-intensive university and we have an incredible immunology department, so we’d like to have a night for them to present their research to students. This event is very attractive to students who are interested in science. University Allergy Education program: Anaphylaxis 101 – a workshop on allergic reactions and how to handle them for university students. A cooking class: We would host an on-campus cooking class to teach students how to cook allergen-free meals for themselves. This would be geared toward students who are living off-campus and cooking for themselves for the first time and remind them of the importance of reading labels and what ingredients they can substitute in place of their allergen. General meetings for our general members: Discuss different topics such as travelling or dating with allergies. Goal of the club is to foster a community. Anita: We’re also organizing a volunteer program, whereby our general members will attend local Hamilton elementary schools and give a brief presentation to raise awareness about allergies to hopefully minimize the occurrence of allergy-related bullying among young children. We will also organize smaller events to better acquaint our general members and create a really allergy community on McMaster’s campus. Anita: I hope to see other universities participate in similar initiatives so that we can nationally spread awareness about allergies! Thanks Alyssa and Anita for being so inspiring! We hope others follow in your footsteps!